Downtown Hartselle, Alabama, with its painted wooden façades and pedestrian-free streets, reminds me of a Western movie set. A railroad crossing frames blocks of a few antique shops and many empty storefronts with hopeful FOR RENT signs. A travel agent, staring out from behind his desk, recalls a diorama in a museum. When a train howls past, the barren spaces echo that lonely sound, and I feel it deep it my bones. But something about the blinking OPEN sign of Willie Burgers gives me hope. This is the land of the old-fashioned hamburger. Found in small restaurants hugging railroads tracks that crisscross the counties of northeast Mississippi, northwestern Alabama, and lower Tennessee, these hamburgers defy hunger and solitude in a region where many workers worry over their next paycheck. Storefronts in Hartselle, AL, and railroad crossing in Selmer, TN. These hamburgers defy hunger and solitude in a region where many workers worry over their next paycheck. Made with beef, pork, or both; extended with oatmeal, soymeal grits, breadcrumbs, and flour; these burgers go by various names. Slugburger, cerealburger, or doughburger. Fillerburger, potato burger, and old-fashioned. Dub’s Burger, Weeksburger, Willie Burger, or Penn Burger. Thin like a discus, cooked in deep oil, they emerge from their bath with a creamy interior and a brown and crispy shell. 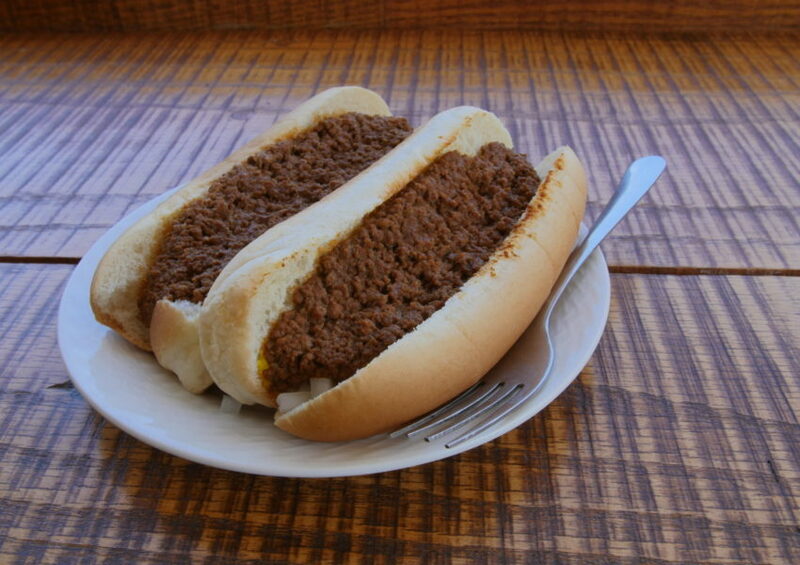 Most customers order them topped with mustard, onions, and maybe pickles. When regulars order cheese, cooks melt the American single by dousing it quickly in the oil. If you want a toasted bun, the cook swabs on more of that oil and toasts it on the flattop. After a year recording oral histories about these hamburgers, I have come to believe that they are not products of nostalgia. 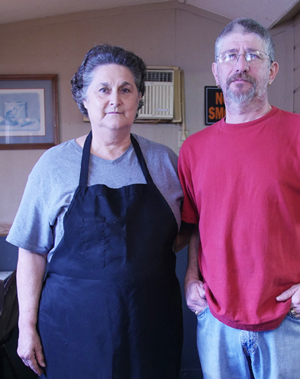 Instead, they remain a constant in towns like Hartselle, Alabama, because when people endure both economic despair and prosperity, they don’t forget the cooks or the meals that sustained them. 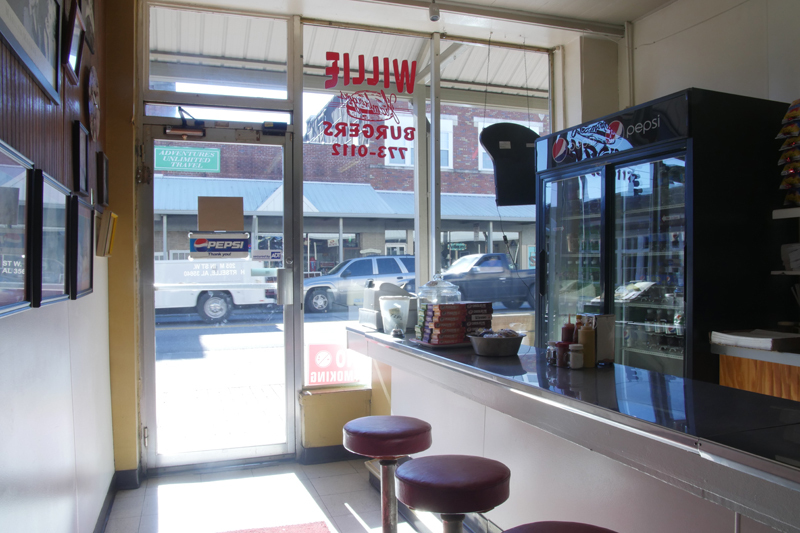 Set at the corner of Sparkman and Main Streets, Willie Burgers began as Johnny’s Hamburgers in 1926. Owners and names changed through the years until 1995, when Willis Sapp bought the business and changed the name to Willie Burgers. Mary Lawson began working for Sapp in 1996, when she and her husband returned South from Indianapolis, where he had worked at the Chrysler plant, to nearby Madison. Lawson says she was lonely and miserable when they moved, but found companionship at Willie Burgers after volunteering each week at the Salvation Army in Hartselle. She’d drop by for a Mountain Dew and a visit with the waitresses. When one of them left to have a baby, Lawson picked up her shifts. In 2000, Lawson partnered with Tony Sapp, son of Willis Sapp, to buy the restaurant. Six months later, he sold his half of the business to Lawson. Now in her sixties, Lawson reminds me of my late grandmother, who chain-smoked her summers away, sunbathing in a lawn chair parked in her driveway. Lawson’s tan underscores her spiky, bleached-blonde hair, a style that earned her the nickname “Scary Mary” from one of her regulars. She speaks openly of her struggles to keep the business going. Last year, her landlord lowered the monthly rent by twenty dollars. He didn’t want to see another downtown building go vacant. The statistics for Morgan County, of which Hartselle is the second-largest city, are bleak. As of 2014, almost 20 percent of families with children under eighteen lived below the poverty line. Lawson tries to meet their needs. She demands that each hamburger be bigger than the bun cradling it. She wants her customers to get their money’s worth. She wants them to leave full. 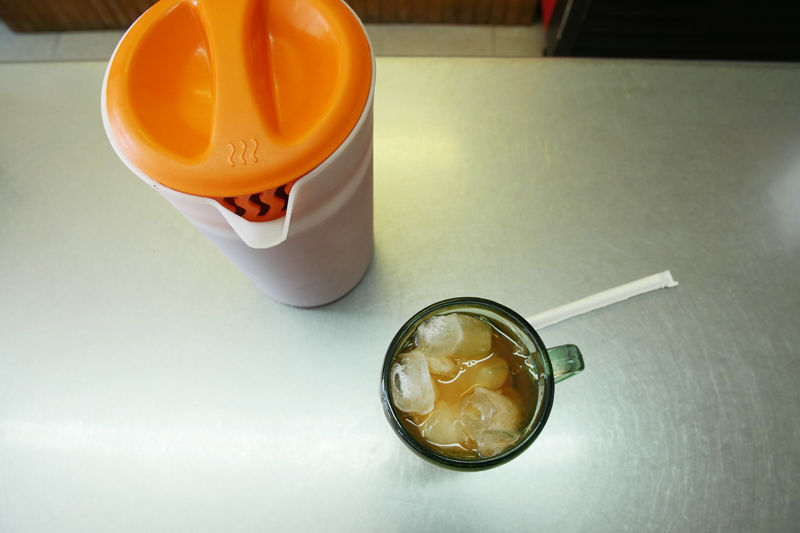 Instead of pouring tea into glasses at the counter, she sets down an empty glass of ice and a plastic pitcher of tea for each customer. She also wants them to feel loved. 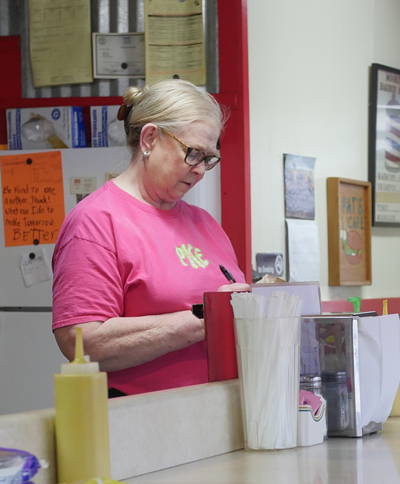 Willie Burgers, like many restaurants in the Lower Tennessee River Valley, demands a kind of intimacy of both customers and workers. A skinny metal counter with squat, red-cushioned stools barely separates customers from staff. That perch affords diners a front-row seat for the choreography, as cooks fry patties and prepare the buns. In an adjacent dining room, Lawson has covered the walls and shelves with posters of Marilyn Monroe and kitchen utensils from her own home, antiques she began collecting when she first moved here because “there was really nothing to do.” She says she spends so much time at work she might as well feel like she’s home. And she shares that feeling with her customers. Mary Lawson and Robin Johnson. 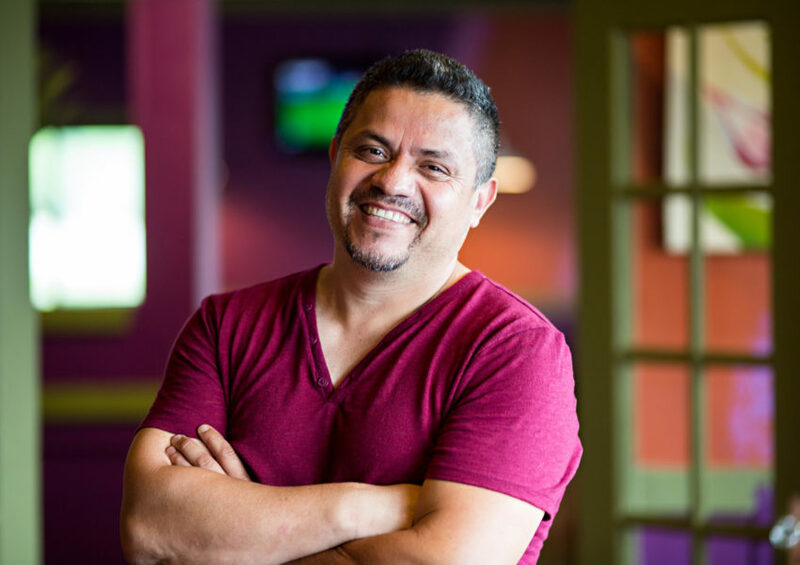 Tending the fryer is Robin Johnson, who has worked at the restaurant since the late 1990s. Fortyish, pale and brunette, Johnson watches skeptically from behind her glasses. During the long gaps between customers, the women take smoke breaks. Each morning, they ride to the restaurant together, smoking cigarettes and talking of their families. Several times throughout the lunch shift, Lawson stops to brag about Johnson’s patty-shaping technique. 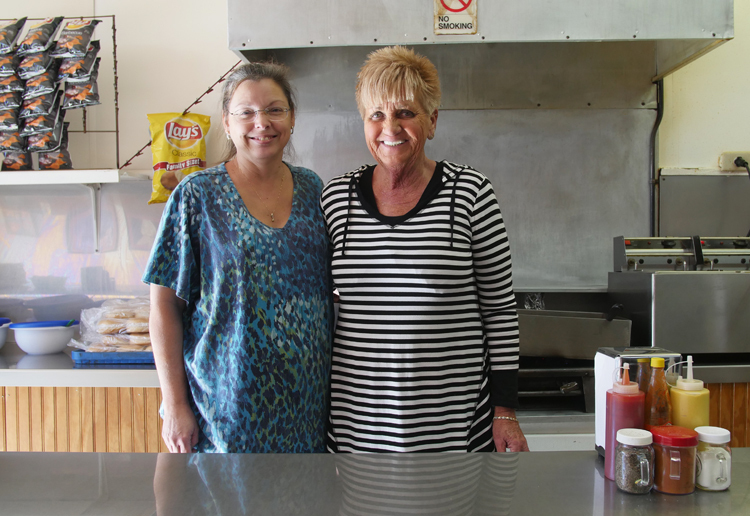 Johnson learned from her mother, Margie, who managed the original Hartselle location of C.F. Penn Hamburgers, once blocks away from Willie Burgers. “This was something that they could feed the whole family and they could stay all day.” Pat Knight, Pat’s Cafe, Selmer, TN. Johnson worked on a factory line making component boards for computers for thirteen years before deciding she wanted to work closer to home. She describes her relationship to Lawson as a sisterhood. Customers, mostly male and white, stop by Willie Burgers for to-go orders and leave with grease-stained brown sacks. Marking the bottom corners of their bags, those stains recall the oil blotches along the cuffs and elbows of their work shirts. 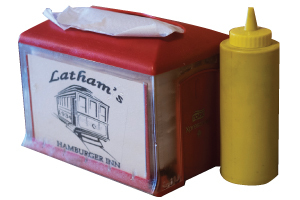 Latham’s Hamburger Inn in New Albany, MS and C.F. Penn Hamburgers in Decatur, AL (Photo by Amy C. Evans). Lawson talks about her customers tenderly. She aims to keep this restaurant open as a place of comfort. Lawson talks about her customers tenderly. She aims to keep this restaurant open as a place of comfort. Lawson tells me about the young woman she let sleep in the back of the restaurant for two weeks so that her abusive ex-boyfriend couldn’t find her. Each night when she closed the restaurant, Lawson locked the girl inside and told her to refuse to answer the door until morning. It would have been very easy to drive through Morgan County, Alabama, passing empty factories, and tell myself this is another landscape where the working class hangs on by a thread. But the truth is evident in the staying power of these cooks and these hamburgers. 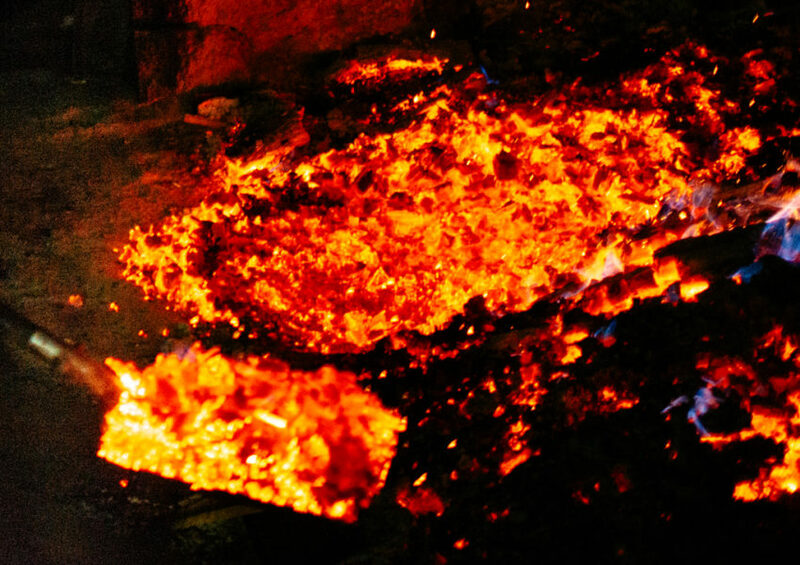 People who call this place home survive by holding on to each other and to the rituals that see them through. Sara Wood is the SFA oral historian and steward of over 800 interviews.